HOPE – The Hope Public School District is preparing a grant application that will create a free school-based health clinic for students and teachers in the school district at the Hope High School campus. Public support for the initiative is currently being sought by Renee Sells, RN, district nurse, and campus nurses Marcia Widel, RN, at Yerger Middle School and Geri Maxfield, LPN, at Beryl Henry Elementary School/Hope Academy of Public Service. 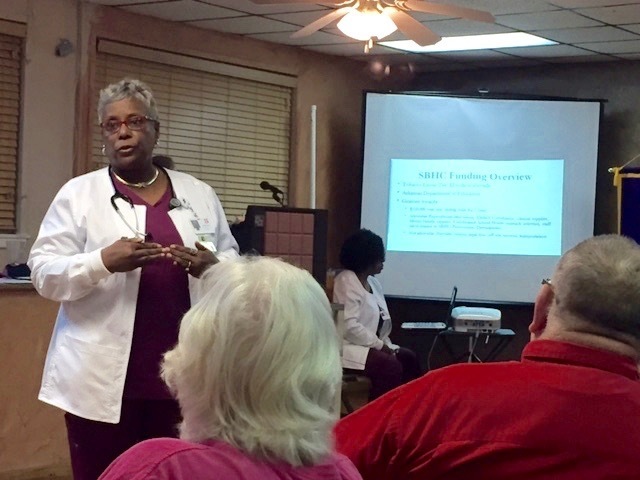 The nursing team has undertaken a public information campaign within the community to explain and generate support for the proposal in preparation for an on-site visit by a state review team this spring. Sells said the district is currently seeking a $500,000 grant from the state through the Arkansas Department of Education that will open and establish operations for the proposed clinic for its first five years of service. Funding for such clinics across the state has been created through a $2 million annual set-aside of tobacco excise tax monies collected by the state, she said. There are currently 28 such clinics already operating, most of which are in the northwest quarter of the state, Sells said. Six currently operate in schools in El Dorado, Smackover-Norphlet, Gurdon, Malvern, Camden, and Mena in southwest Arkansas. “This year, we are going to be up against applications from 32 other school districts,” Sells said. The proposed Hope clinic is to be housed in the former home and family sciences “cottage” on the HHS campus. Sells said the proposed clinic will offer both physical and mental health services, based upon grant guidelines, under a school/community/family partnership approach. Renovations to the “cottage” will be undertaken with the first $150,000; while, much of the furnishings and equipment needed for initial operations has already been donated by Wadley Regional Medical Center-Hope. Plans call for beginning operations in the Spring, 2019, semester. She said a committee reflecting that partnership has been working to write the grant application. “The core committee vision is to provide a comprehensive health program for students and staff by offering on-site health services that will result in a reduction of class absences, thus improving academic performance, and resulting in healthier students who otherwise may not have services accessible to them, and, ultimately, promote generational healthy lifestyles,” she said. Clinic operations are proposed through the district nurse’s office with a nurse-practitioner on site, and medical services overseen by a community physician partner, Sells said. She said billing and other fee-related services will be handled entirely by the physician partner. “We will not be competing with the local hospital or with local doctors,” Sells said. Sells said Dr. Sandra Sooman has agreed to become the community physician partner for the clinic. Mental health services will also be provided on-site in the same manner, Sells said.